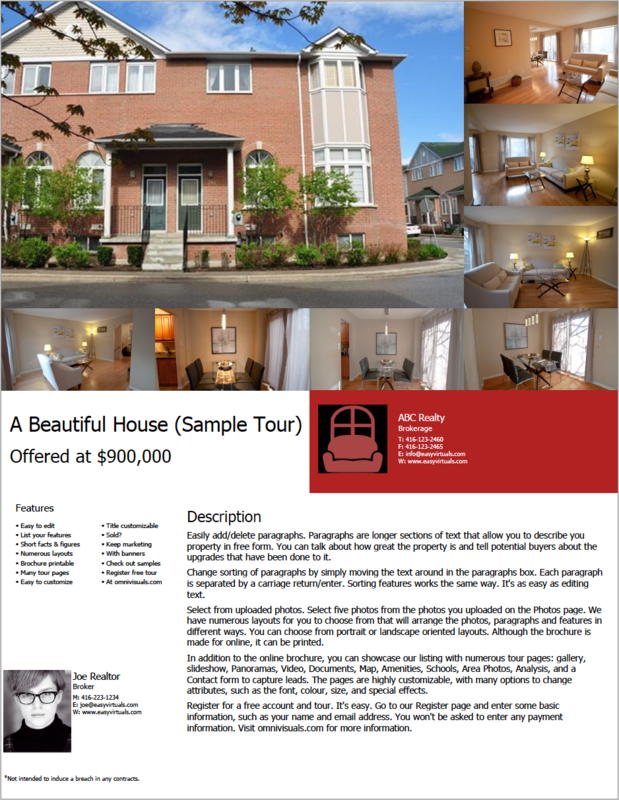 Create AWESOME Virtual Tours and PDF Feature Sheets for your listings. 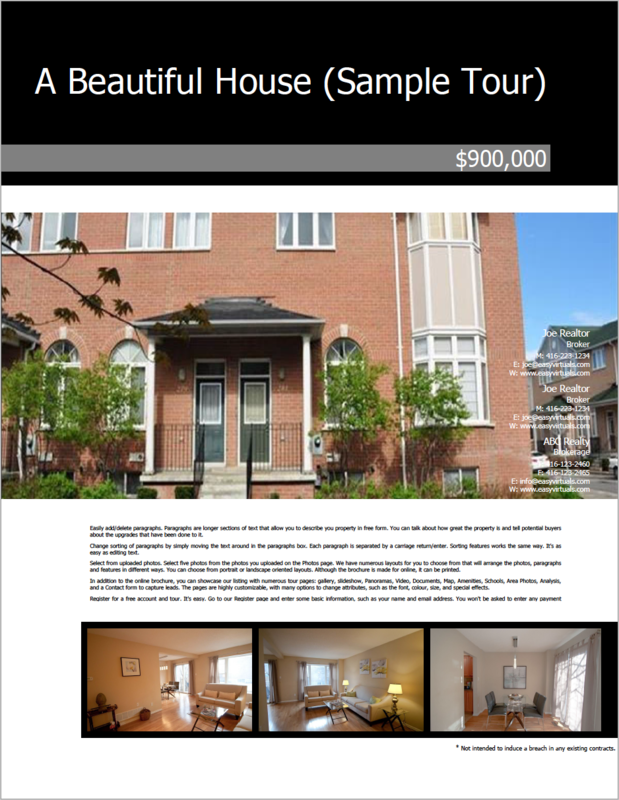 Do it yourself and save hundreds of dollars per listing. Customize how your property photos are displayed. Grab their attention with an eye-catching Gallery & Slideshow for your MLS listing, website, email campaign, social media and more! Then Go Beyond Photos. Way beyond. Showcase your client’s castle, make it look good & you’ll look good. It's about more than just the photos, it’s the whole package! Life isn’t lived with blinders on. to describe your property features. and what’s in the area. then we’ll do the work for you. Branded tours feature your profile, your company’s, and/or your team. Unbranded tours contains no personal or company information, helping you meet the requirements of your real estate board so your virtual tour can be linked to their listing page. Find out more about profiles, and other features, below. Choose from a number of layouts, customize colours, and more. 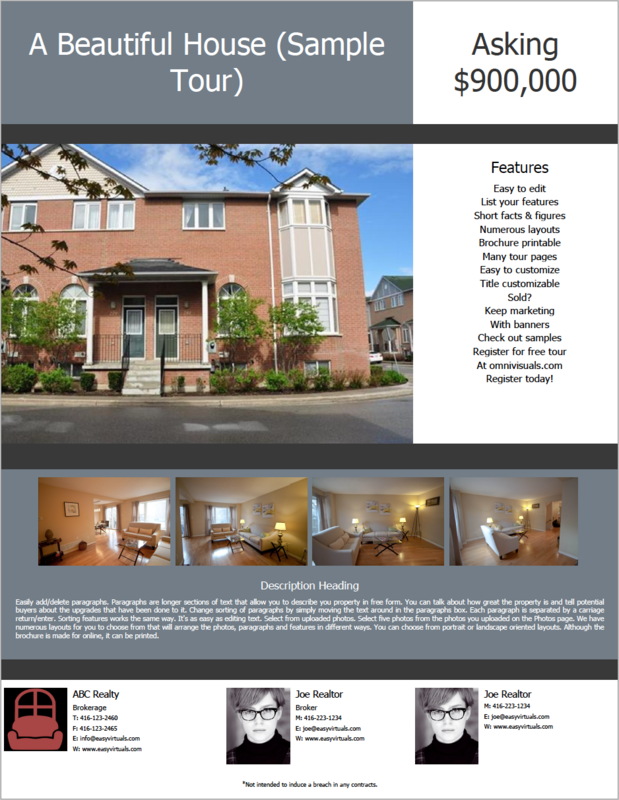 Download the feature sheet in PDF format and you’re ready to go! 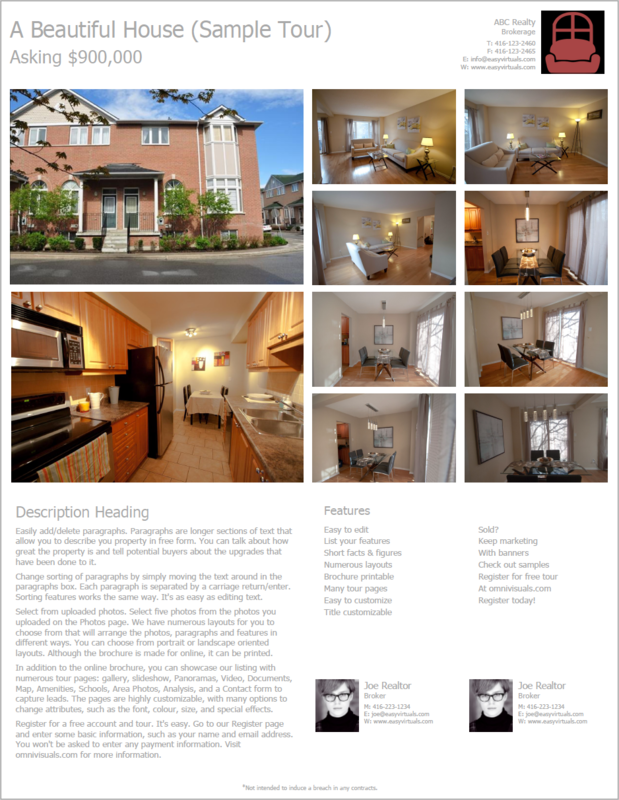 Here are some of the layouts you can choose from. at the top and bottom of each page, or both! and layouts to make the tour your own! the tour pages in any order you like! as a call to action for potential clients! And customize it to reflect your style. 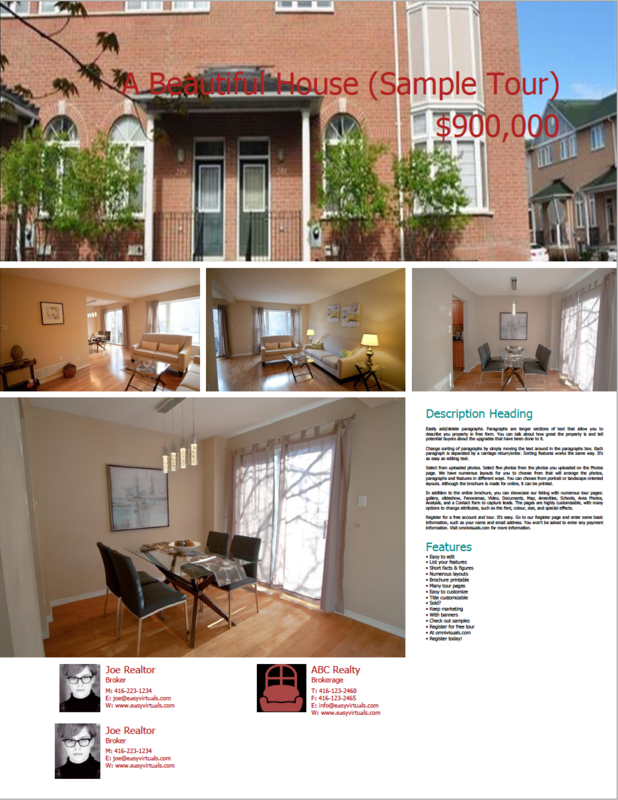 Have an open house or new lising coming soon? Turn on a Splash Screen as a call to action for visitors. Tell visitors to come to an open house, to check out a new listing coming soon to the MLS, about an offer date or other important action or information. You can customize the date range that the splash screen is active, the text and other aspects of the splash screen, such as the background colour or image. colours to suit your needs! Customize page titles to suit your style. font style, font size and more! without giving them access to your account. You can remove access anytime. of the web as possible. Make sold listings continue marketing for you with Banners. 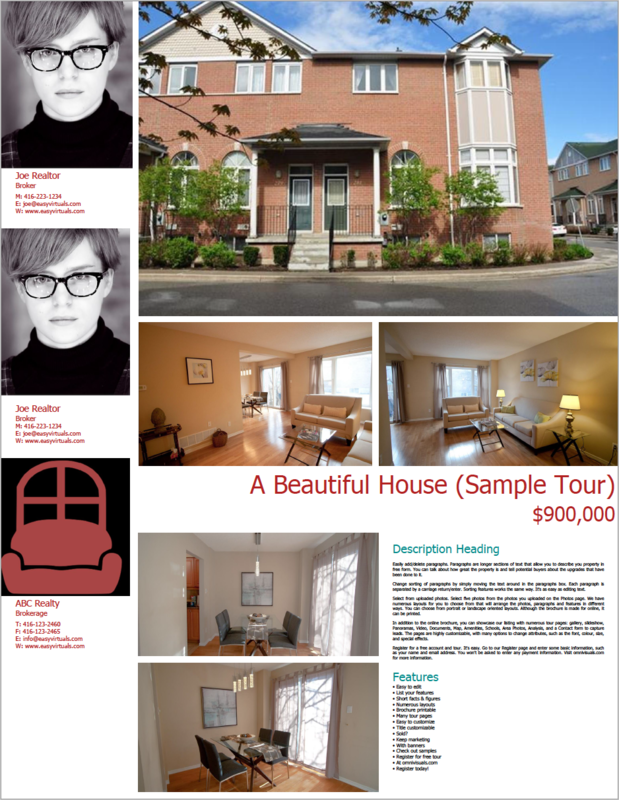 After your listing is sold or becomes unavailable, you can enable a banner on top of the tour with a customizable marketing message and/or video to help potential visitors continue to find you, past the life of our listing. You can for example say, "Sorry, the listing you reached has sold. Please call me about other homes!" Big and small, we’ve got QR codes for them all. open your tour without all that pesky typing of URLs. who want to type the URL into a browser. Register for a FREE, no-obligation, account & get one FREE 10-day tour to test drive! New Tours cost $23.99 each and last 100 days. Need more time? Extend any current tour for $18.99 per 100 days.